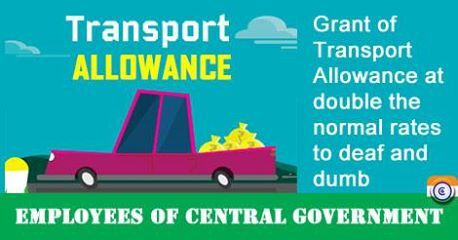 Subject: Grant of Transport Allowance at double the normal rates to deaf and dumb employees of Central Government. In supersession of this Department 0.M.No.21(2)/2011-E-11(B) dated 19.02.2014 regarding admissibility of Transport Allowance at double the normal rates to employees who are deaf and dumb, the undersigned is directed to say that the matter has been re-examined and it has been decided with the approval of Competent Authority that Transport Allowance at double the normal rates is admissible to Hearing Impaired employees also in addition to employees who are both deaf and dumb. 3. The admissibility of Transport Allowance at double the normal rates to above categories of employees is subject to recommendation of the Head of ENT Department of a Government Civil Hospital and fulfilment of other conditions applicable in respect of other disabilities mentioned in D/o Expenditure’s O.M. No. 19029/1/78-E-IV (B) dated 31st August, 1978 read with 0.M.No.21(2)/2008-E.11(B) dated 29.08.2008. 4. In so far as the persons serving in the Indian Audit and Accounts Department are concerned, this order issues in consultation with the Comptroller And Auditor General of India.